CAUTION: The algorithm to carry out this operation has been developed by myself and needs a lot of additional tests to assure its accuracy. This function is used to convert data using functions of x, y and z. The "Apply expression" window opens by clicking this button. 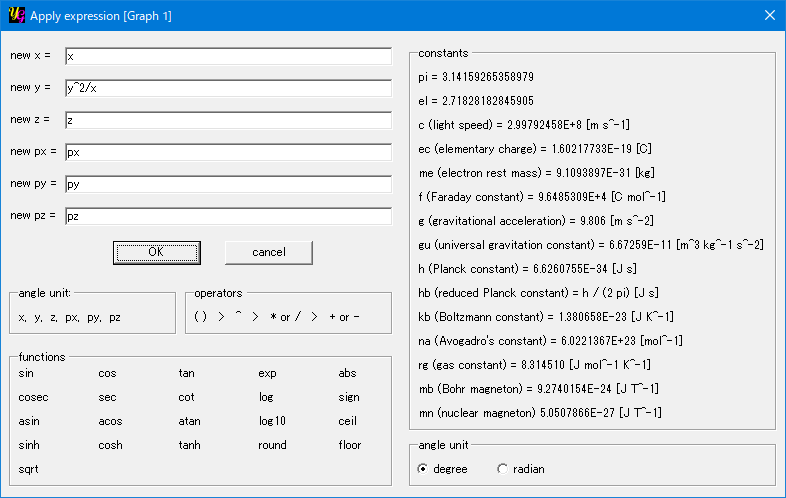 A list of operators and functions to make your functions are shown in the window. The operators and parenthes are in the order of priority that is as same as in mathematics. The functions you can use are as follows. sqrt: This gives the square root a number. abs: This returens the absolute value of a number. sign: This returns the sign of a number. ceil: This returns the smallest integer greater than or equal to a number. floor: This returns the greatest integer less than or equal to a number. round: This returns the integer closest a number. x = sqrt(x^2 + y^2 + z^2) * cos(y) * sin(z). Do not forget to use "*" to multiply a function or a number to another. Errors in your functions may give incorrect result. The variables x, y and z are old data before the operation. Two constants pi and Eular's e can be entered as "pi" and "el". You can also select units of angle used in trigonometric functions from degree and radian.